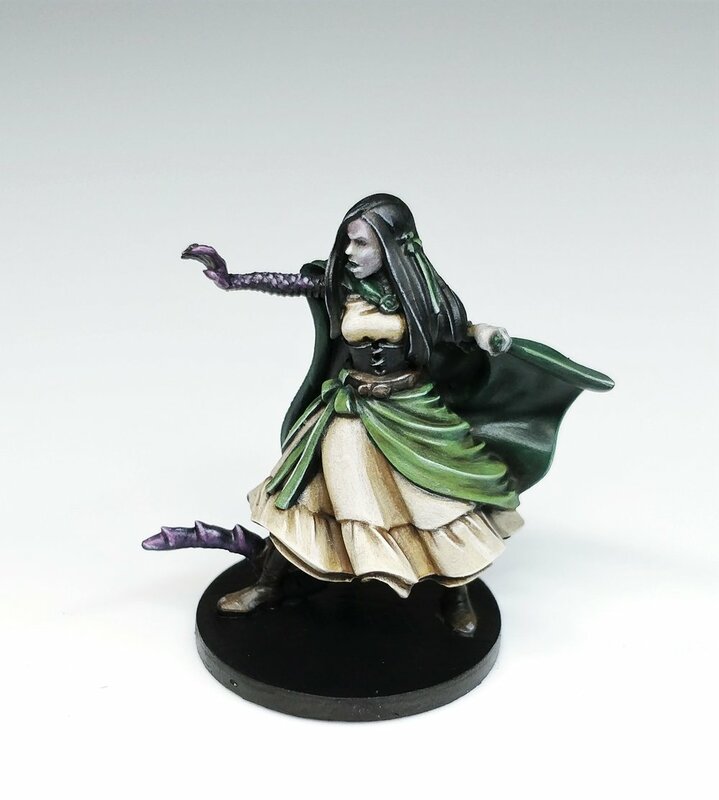 Ordered Calianna and want some painting inspiration? You’re in luck! We’re back with another painting tutorial, this time for Calianna. Enjoy! Start out by cleaning and priming your miniature. If you are new to working with resin, check out the previous blogs that will help you with this process. Prepping your miniature is a very important step as it will help make the painting process much smoother and more enjoyable. For this tutorial, Army Painter paints were used. These are nice paints that are widely available online and at your local game store. When using Army Painter be sure to shake them very well, and when you squirt them out onto your pallet mix them with a wet brush before applying them to your model. I recommend their Regimental Brush as well, it is what was used to paint this whole miniature and is a great all-around work horse brush. If you’re brand new to painting and find it all a bit intimidating, we hear you! To achieve a great looking paint job using some fantastic beginner techniques, only follow step 1, step 2, step 3, and step 6. These steps show the basics of blocking in base colors over the entire miniature, adding some washes to these base colors to help bring out the detail of the sculpt, and some finishing touches such as basing your miniature! To help keep things clean and tidy, work from the innermost details moving outwards. To help you keep track of which colors to use, you can follow the order of the listed paints above. To achieve good coverage over the black primer, each color will take at least two thin coats of paint. This applies to all the colors above except the Oak Brown and the Orc Blood, which will only need one thin coat. It will let the black of the primer show through and leave the colors nice and dark. The dress may take a few extra coats to get good coverage, but just take your time and make sure to let thin coats dry before applying new ones so you don’t remove a layer you have already painted. Use the direction of the ripples on the clothing to help hide brush strokes. Just as before, for this layer of paint you will work from innermost to outermost details in order of the listed paints above. Using thinned paint (1-part paint 1-part water) layer the dress with Skeleton Bone, try to avoid getting paint in the creases and folds of the cloth. Then do the same with Goblin Green for the apron and ribbons. For the hair gently use the edge of the brush with just a small amount of Ash Grey on the brush and lightly run it along the upper most edges of the hair. This same technique can be used on the stitching and ribbing of the corset. Then use the Ash Grey to clean up the face if needed. If you make a mistake on the hair not to worry just go back over it with some thin black to tone it down. Painters Note: Steading your hands and having your mini on a holder will help greatly with brush control, allowing you to be more accurate with your brush strokes. These washes will help to shade the model and smooth out brush strokes. Mix them well but don’t water them down too much or they can dry leaving a very chalky finish. Apply the washes to the different areas of the model as show in the list above. If you apply too much simply rinse your brush, dry it off, and then use it to wick up the excess wash from the model. You will want the wash to pool in the creases and folds of the cloth to help shade the model, but be aware of excess wash pooling toward the bottom of the miniature. The washes can tone some colors down too much, so you will want to bring back some contrast by carefully painting the raised areas. Again, use nice thin coats to build up your color and try to avoid getting paint in the recesses. For the face it can help to turn the model upside down, granting easier access to the edges of the face such as the nose, cheek bone and lips. If you make a mistake you can use some wash to hide it, but also having a wet clean brush on the ready to wick away any excess paint that gets applied to the model can be very handy. Wash will often pool in the eyes and mouth, if you wish to add more definition to these details of the face you can use a fine tipped brush with some black on it to do so. Make sure to angle the model horizontal to your brush so that it is easier to paint on the eye. If you paint on too much black simply go over it with some Ash Grey. At this point you could call your model done and finish it off with a nice base. For some help on basing skip to step 6. However, if you really want to make your model pop on the table move on to step 5! Step 5 - Final Layer: edge Highlights and touch ups. For the dress add a layer of Mummy Robes on the most raised areas to really help the dress pop. The rest of the model can be edge highlighted, which is a quick and easy way of highlighting. Make sure to use a damp brush with most of the paint removed. Then very gently and at a crossed angle to the line you are painting brush along the edge. Take your time and steady your hands well, it can take a few strokes of the brush to get the desired effect. The image of Vanessa below does a good job of demonstrating the sort of angle you’re looking for. For the face it can help to turn the model upside down to get an easier angle on its edges. 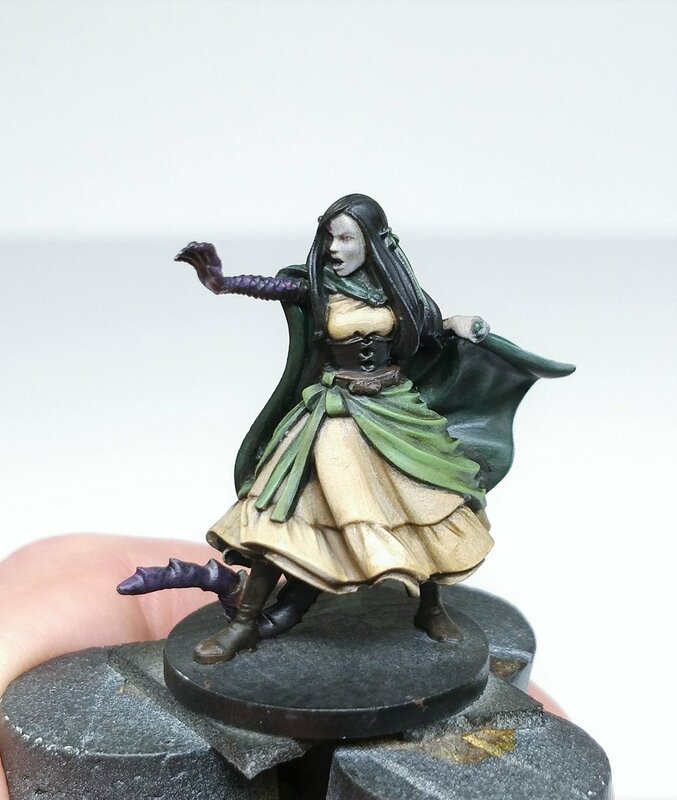 We hope you have enjoyed this tutorial and found some useful tips to help you complete your very own Calianna miniature. If you find yourself struggling with a technique or are unsure where to start do some test painting on other miniatures first or even on paper to help with brush control and paint flow. We would love to see your results so post them up on Twitter using #CrittersPaint hashtag!